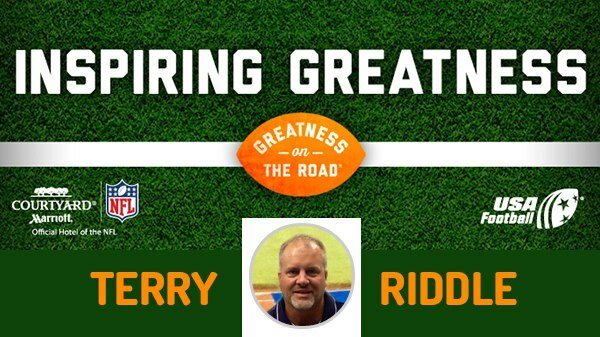 FYFCL’s Terry Riddle is winner of the 2014 Inspiring Greatness Coaches’ award. USA Football has teamed up with Courtyard by Marriott, the official hotel of the NFL, to recognize and reward youth and high school football coaches from across the country that inspire greatness in others. As part of Courtyard’s Greatness on the Road campaign, Coach Riddle will receive a commemorative helmet trophy and a $1,000 equipment donation from Courtyard by Marriott for the West Orange Bobcats. Riddle was selected this year to serve on USA Football’s newly established Commissioner Advisory Committee to advance important standards for America’s youth football community. He is the Head Coach for the West Orange Bobcats 12U team, the President of the West Orange Bobcats Youth Football and Cheer organization, the President of Florida Youth Football and Cheer and the AAU Florida District Director, Tackle Football and Cheer. He is managing partner and owner of H&R Properties of Central Florida and the owner of Amateur Athletic Sports International, the current host of the AAU Tackle Football National Championships. Riddle’s two sons, Carter, 12, and Camden, 10, play for the West Orange Bobcats.